Happy Thursday, babes! Today I am so excited to start my New England Travel Series! My first guide is sharing how to spend 24 hours in Boston’s Back Bay! If you don’t know this about me, I went to college a short ride away from downtown, and after graduating college, I lived and worked in the city for three years. I thought it would be fun to do a New England series of how to spend a day in different neighborhoods/towns in Boston, CT, and beyond! Boston invokes nostalgia for so many reasons-the culture, my friends, food, sports, nightlife, a bustling young professional scene- just to name a few! Confession-when I lived in Boston, I very rarely “played tourist” in my own city, so some of these experiences were for the first time! The most exciting way to experience Boston is to spend the night in the heart of the action. Fairmont Copley Plaza is in Copley Square: close to the Back Bay and the iconic Beacon Hill, Newbury Street shopping, and a short ride from the up-and-(already)-coming Seaport, and the infamous Italian North End. The Fairmont is old school glam– chandeliers, spiral staircase, and library-chic sitting areas tucked in the corners. Walking through the front door takes you back a few decades with the elegant-glam feel of walking in to a 1900-era gala. A little fun fact for sports fans-the hotel opened in 1912 which is the same year Fenway Park opened. The staff is very accommodating and will even help with off-the-grid finds. The chief residents are the two hotel labs-Gracie and Carly Copley-i.e. 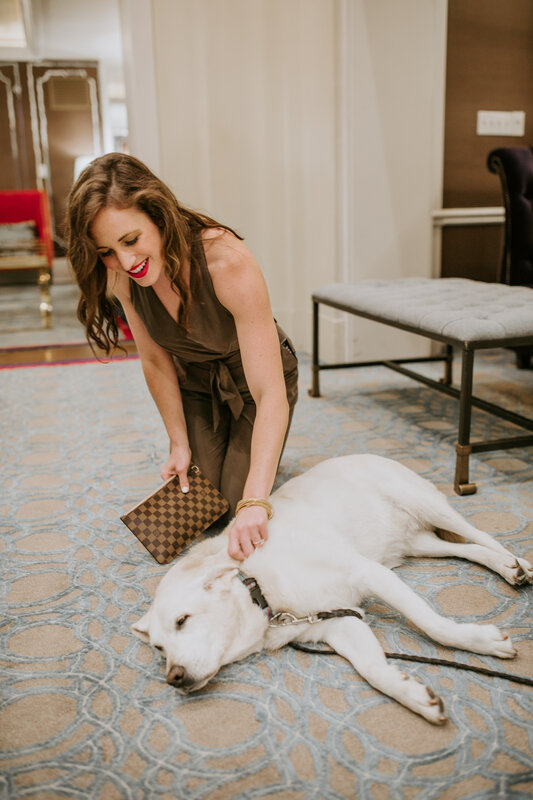 yes, the Fairmont is dog friendly! The OAK Long Bar +Kitchen is the hotel’s restaurant-the bar scene was buzzing-even on a Wednesday night. The contemporary, farm-to-table restaurant offers handcrafted cocktails- the perfect way for to end (or begin) your evening in the city! Upon getting settled in your room at the Fairmont, the luxury experience continues–music playing on the TV upon your arrival, the elegant decor, and a huge marble bathroom. Many rooms overlook Copley Plaza for a scenic view of Boston! If you brought your sneakers, check out the 3,000 sq. foot rooftop health club for a quick workout. The Concierge may even help suggest running routes in the city to check out some other neighborhoods/sites! The Fairmont Copley rooms are elegant and upscale with marble bathrooms and accents, yet still comfy and feel like home. Boston + food=say no more! Whether you’re in the mood for an app and cocktail or hungry for a meal, check out Southern Proper for a taste of Southern Home cooking. The ingredients are sourced fresh from local New England farms. The apps were so appealing we couldn’t choose just one (or two), so our “bite” quickly turned in to a whole meal. The fried chicken was cooked to melt-in-your-mouth (just a heads up: the spicy was extra spicy), the vegetables were crisp and flavorful, and the sweet potato hoecakes (similar to pancakes) and hush puppies were light and flavorful. 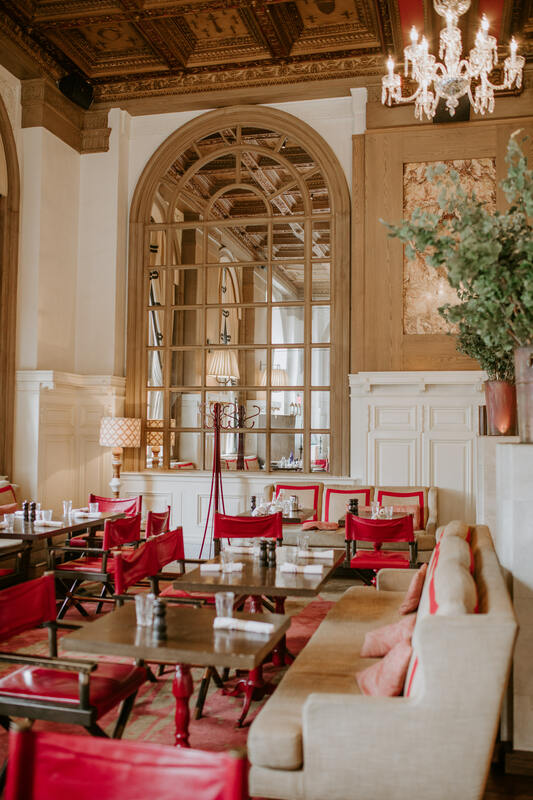 For breakfast or brunch and coffee in the morning, Tatte Bakery + Cafe (the Bolyston Street location) is a short walk from the Fairmont Copley Plaza and has a variety of food options: from baked goods and pastries to avocado toast and salads. The avocado toast with eggs is a light and fresh to start the day. Don’t forget to take some delicious pastries to go (delicious)! Boston is thriving with activities from sightseeing historical landmarks to shopping designer boutiques in Copley Place. The Boston Public Library is a must-see. Take a stroll through the sweeping main room and the garden area! The library is a working library, so you will see many people studying! It honestly reminds me of Harry Potter! The charming area of Beacon hill is iconic Boston with it’s brownstones and cobblestone streets. Take a walk (or drive) around and try to find iconic Acorn street-aka the most photographed street in Boston! Also don’t miss this historic home for an IG worthy shot-I’m sure you’ve seen it on Instagram (third photo down). The availability of shopping in Boston is dangerous! Copley Place is two stories of high end boutiques -think Neiman Marcus, David Yurman, and Louis Vuitton. Newbury Street is a short walk away where you’ll find shopping destinations such as Forever 21, Lululemon, and TJ Maxx. Surrounding streets hold a few more favorites such as J.Crew, Madewell, and Nordstrom Rack. I hope this guide helps you maximize your time in Boston. Whether you’re staying for a night or a week, there’s always a reason for a visit to explore Boston. Previous Post: « 3 Step Guide to Never Running Out of Gift Ideas (And Giveaway)! Oh my gosh, I’m fan hurling HARD over these photos! Literally want to pack my bags and move now 😂 Aslo, that jumpsuit was practically made for you! So cute! we should plan a blogger trip to Boston!! Thanks girl!! First, loooove that jumpsuit you’re wearing! I’ve only been to Boston once for an afternoon but when I make it back I’ll have to stop at a bunch of these places! You must make plans to go back-it’s gorgeous in the fall!! Great recommendations! Love Boston and look forward to some of your stops next time! I hope you get to make a trip soon!! Great reminder that Boston is a nearby and great city. Thanks for the post and gorgeous photos! Yes! It’s definitely easy to do a day in Boston!! I LOVE Boston! I will have to try these restaurants ! Yes! Let me know if you do!! Boston is such a fabulous city to visit! Great guide! Boston is the best! Great post! It’s one of my favorite cities! Thanks Jill!